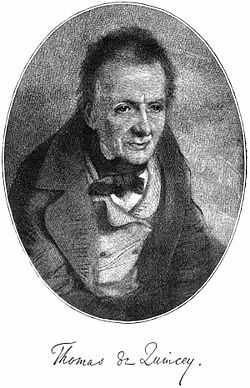 Thomas de Quincey (August 15, 1785 – December 8, 1859) was an English author and intellectual, famous for his book Confessions of an English Opium-Eater. He was born in Manchester. His father was a successful businessman with an interest in literature who died when Thomas was quite young. Soon after Thomas's birth the family moved to The Farm and then later to Greenhay, a larger country house near Manchester. In 1796 De Quincey's mother, now a widow, moved to Bath and enrolled him at King Edward's School, Bath. Thomas was a weak and sickly child. His youth was spent in solitude, and when his elder brother, William, came home, he wreaked havoc in the quiet surroundings. De Quincey's mother was a woman of strong character and intelligence, but seems to have inspired more awe than affection in her children. She brought them up very strictly, taking Thomas out of school after three years because she was afraid he would become big-headed, and sending him to an inferior school at Winkfield in Wiltshire. In 1800, De Quincey, aged fifteen, was ready for the University of Oxford; his scholarship was far in advance of his years. "That boy," his master at Bath School had said, "that boy could harangue an Athenian mob better than you or I could address an English one." He was sent to Manchester Grammar School, in order that after three years' stay he might obtain a scholarship to Brasenose College, Oxford, but he took flight after nineteen months. Discovered by chance by his friends, De Quincey was brought home and finally allowed (1803) to go to Worcester College, Oxford, on a reduced income. Here, we are told, "he came to be looked upon as a strange being who associated with no one." During this time he began to take opium. He left, apparently about 1807, without a degree. In the same year he made the acquaintance of Samuel Taylor Coleridge and William Wordsworth, having already sought out Charles Lamb in London. His acquaintance with Wordsworth led to his settling in 1809 at Grasmere, in the beautiful English Lake District; his home for ten years was Dove Cottage, which Wordsworth had occupied and which is now a popular tourist attraction. De Quincey was married in 1816, and soon after, having no money left, he took up literary work in earnest. In 1821 he went to London to dispose of some translations from German authors, but was persuaded first to write and publish an account of his opium experiences, which that year appeared in the London Magazine. This new sensation eclipsed Lamb's Essays of Elia, which were then appearing in the same periodical. The Confessions of an English Opium-Eater were soon published in book form. De Quincey then made literary acquaintances. Tom Hood found the shrinking author "at home in a German ocean of literature, in a storm, flooding all the floor, the tables, and the chairs—billows of books." Richard Woodhouse speaks of the "depth and reality of his knowledge. ... His conversation appeared like the elaboration of a mine of results. ... Taylor led him into political economy, and the study of classics." From this time on De Quincey maintained himself by contributing to various magazines. He soon exchanged London and the Lakes for Edinburgh and its suburb, Lasswade, where he spent the remainder of his life. Blackwood's Edinburgh Magazine and its rival Tait's Magazine received a large number of contributions. The English Mail-Coach appeared in 1849 in Blackwood. Joan of Arc had already been published (1847) in Tait. De Quincey throughout his life drank laudanum—after 1821, twice in great excess. During his last years he nearly completed a collected edition of his works. His immediate influence extended to Edgar Allan Poe, Fitz Hugh Ludlow and Charles Baudelaire, but even major 20th century writers such as Jorge Luis Borges admired and claimed to be partly influenced by his work. Berlioz also loosely based his Symphonie Fantastique on Confessions of an English Opium Eater, drawing on the theme of the internal struggle with one's self.